What is this symbol on a Seattle parking sign? What is this symbol that has been posted on parking signs all over Seattle? A few years ago, the city of Seattle replaced its old-school parking meters with a single pay station on each block. 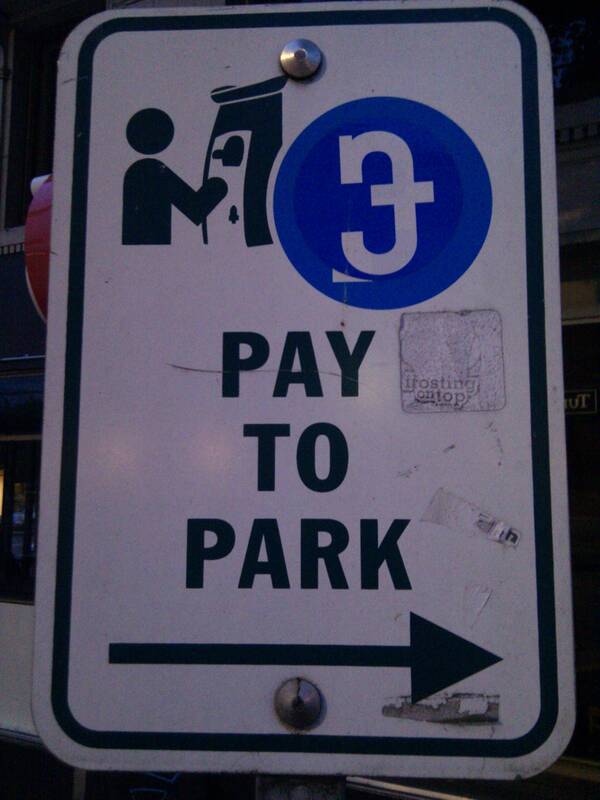 There are two or three signs per block that say "Pay to Park" and point toward the pay station. On these signs there is (or was) a blue circle with a white "P" in the middle, presumably standing for "Parking". Over the past several months, I've noticed that the "P" has been replaced on many signs with a symbol (see link above) I don't recognize. It's a sticker that someone has placed on the sign with the blue background perfectly matched. (Ignore the white sticker next to the word "pay", I'm talking about the symbol in the blue circle.) I've seen this on dozens if not hundreds of signs all over Ballard, the U District, Capitol Hill, and Downtown, and those are just the areas I go to most frequently. Does anyone know what this symbol means and why someone has put it up all over town? Does it appear anywhere else? Looks like a stylized, connected-up "f" and "u" stuck on upside-down. Reverse epsilon? Cyrillic small e? See. This (Э) might be it. I don't know but I'd guess it's some kind of e-parking symbol so that you can buy your tickets with your mobile phone. I was looking on the Seattle parking website earlier and couldn't find this as a logo. They have an e-parking logo but this isn't it. Looks like graffiti to me. My initial reaction was to see it as a form of the IPA letter Eng (ŋ), but eng doesn't take a crossbar that I know of—and what would it mean? Is it used prominently in Salish? Perhaps, as Sys Req suggests, it's conjoined letters... if the others you've seen are all in this same orientation, though, then it's probably not "f-u" but "n-j," whatever that means outside of the Garden State (also, worst logo ever). Screwy reinterpretation of the currency symbol for new sheqalim? Tried feeding your image to Google and it identified it as "capitol hill seattle," but that's because it knows the signs from this: http://seattlecapitolhill.tumblr.com/post/903426863. I'll follow this with interest. I think SysRq's first idea is correct. Turn it upside down and it does look exactly like an 'f' on top of a 'u'. I bet this is somebody's protest against being asked to pay for parking. Or somebody who hates having to walk to the end of the block to do so, instead of having a convenient parking meter located right at the parking spot. Sys Rq: Looks like a stylized, connected-up "f" and "u" stuck on upside-down. Yes, and it looks like a sticker that is too small to cover up the actual sign (you can see what may be the leg of a blue P behind the sticker). I see an "n J." It could be an attempt at viral marketing for a local band. It could be an attempt at viral marketing for a local band. Yep. It's a sticker for Nefarious Jones. Huh. The Stranger page that I linked to above had a picture of the sticker logo in the photos column, five toed sloth... and now suddenly it's no longer there. This wasn't some kind of memetic scavenger hunt test, was it? Um. Weirder still, it was the cover art for that track when I linked to it earlier this afternoon. It has since been replaced with the image of the roadrunner. Weird. I saw the logo on that page, was disappointed that the answer to the mystery turned out to be a crappy bar band, and moved on. Now it does appear that they are purging the logo from their public image (although it's still on one post off their Facebook wall). Why? Perhaps they fear the stern gaze of Metafilter. That's a plate of beans for another day. Great detective work, though. Thanks for clearing that up for me.